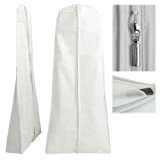 Showerproof 72″ wedding dress / gown cover- protective PEVA material. Gorgeous white colour. Large 8″ bell shaped tapered gusset- plenty of room for trains & petticoats. 72″ long, 26″ wide with full length quality size 5 zip. Strengthened loop on lower seam for hanger hook – garments easily carried folded in half. Clear and large PVC document pocket. With secret internal zipped pocket – for keeping valuables, mobile, jewellery, and lingerie together with your outfit and out of sight! All Hangerworld branded covers are guaranteed to be acid free (PH neutral) and colour run resistant. Ideal for travel & short term storage. High quality showerproof gown cover at 72″ length. Perfect for storage, travel and protection from dust & dirt. Now with secret zipped internal pocket.